The duke’s whispered proposition left no room for doubt about the conclusion that has been drawn about Regina’s presence, and she left the scene quickly. But it was not quick enough to keep Jason Edward Thomas, Duke of Torquay, sometimes known as the Black Duke, from determining that Regina would be his newest toy. When his carriage is seen near her uncle’s home, Regina tries to disregard her maid’s scandalized reports of abduction, but even her uncle upon his return is concerned, admitting that, wealth or no, he is no match for the duke. St. John Basil St. Charles, Marquis of Bessacarr, who recouped the family fortune lost by his gambling father through a business partnership with Regina’s uncle, promises to do what he can to protect Regina from Torquay, but Bessacarr is so fearful of his connection with trade being discovered that he concludes he can do nothing. When Regina’s uncle dies before he can change his will, Regina is left penniless and thus more vulnerable to Torquay’s schemes. She soon discovers that not only has the duke not lost interest in her but he also has no qualms about doing what he must to place her in his power. After his lies and manipulation have closed every escape, he makes clear that Regina has no recourse but to accede to his demands. Regina cannot believe that Torquay can look upon her as an object to be manipulated for his pleasure. Her attempt to reason with him intrigues the duke, but he is direct in assuring her that his heart cannot be moved. You speak almost as well as a man. It will be a novelty to make love to a woman who seems to have a man’s mind. Perhaps it will be the best of all possible things. But as for your protests, Regina, I hesitate to contradict such an enlightened mind, but you do not know of what you speak in that case. You are ignorant of all the things that I am master of. You are, since you do seem to enjoy analogous reasonings, rather like a newly hatched chick who asks the hawk what possible joy he finds in soaring. releases her with the warning that if she fails to find a safe, moral harbor for herself, she will belong to him. Regina turns to her uncle’s former business partner, the Marquess of Bessacarr, for help. Bessacarr, less than a decade younger than Torquay, is almost as infamous for his licentiousness. He is perhaps more reprehensible because he lacks the duke’s honesty. He agrees to protect her, sending her to play companion to his distant cousin and close friend, Lady Amelia Burden. But he is as determined as Torquay to have Regina as his mistress. What neither man expects is to have his determination to best his rival and emerge victorious in his pursuit of Regina turn into a transformative experience that has him hoping to win her love. The Duke’s Wager was Edith Layton’s first book, and more than three decades after its original publication, its characters remain as extraordinary and its story as compelling as ever. Redeemed hero stories are plentiful in romance fiction, but I know of no other novel that features two aristocrats who are more villainous than heroic and delays both redemption and the revelation of which wins the heroine until the final pages. Regina is a woman outside their experience. Her motherless upbringing at the hands of a scholarly father who taught her without regard to her gender and a radical governess who deliberately failed to instruct her in feminine decorum and accomplishments has rendered her peculiarly classless. “She had the manner and grace of a lady, the education of a young gentleman, and the family background of sober, strict bourgeois merchants.” Her values are clear, but they are untested. She is not merely beautiful but also learned, forthright, and capable of rational thought. Despite all these virtues, she is an immensely likeable heroine. Layton reveals these characters to her readers through internal monologues and conversations to a degree rare in current romance novels. However much we as readers may enjoy reading repartee between the hero and heroine, it is no substitute for the interchanges of Layton’s characters. The result is an understanding of and an engagement with these characters that is present even when the reader dislikes or disapproves of a character’s actions. Perhaps Layton’s greatest achievement is that she keeps the reader guessing about whether an HEA is possible—or desirable—and whether the duke or the marquis will prove to be the novel’s hero. Between The Duke’s Wager and the posthumously published To Love a Wicked Lord (2009), Layton wrote more than fifty romance novels and novellas, many of them true gems of the genre. 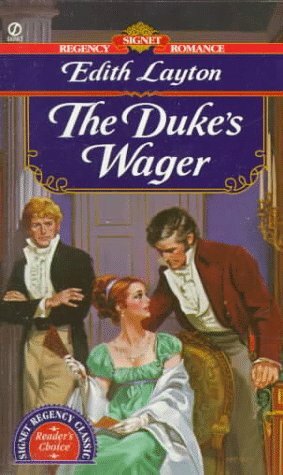 By a wide consensus, The Duke’s Wager ranks as a romance classic. It has been on my top 100 list since I compiled the first one fifteen years ago and a keeper for much longer. If you have never read it, I give it my highest recommendation. If you read it long ago, I assure you it is worth a reread. Thanks to Layton’s daughter, The Duke’s Wager and other of Layton’s early titles are now available digitally. Red Jack’s Daughter was added just this month. I am sad that there will be no more new Layton books, but I am delighted that readers new to Layton can now easily access many of her novels. I am keeping my fingers crossed that we will see a collection of Lady Layton’s wonderful Christmas novellas as well. Meanwhile, having reread The Duke’s Wager twice, I’m about to reread The Disdainful Marquis. What a terrific review. I have been wanting to read some books by Edith Layton and now it's a must! Thanks for sharing. Thanks, Connie. She was an extraordinary writer. I have a full shelf of Layton keepers, and I am adding them to me Kindle as they become available. Another author I've been meaning to read - I just can't keep up! Her books are worth finding time for, catslady, and The Duke's Wager is a great place to start. PJ, I hope many readers are following your example. Her books are too good to be forgotten. I will have to check my stash of old Regencies. The cover looks a bit familiar. It sounds like one I would have picked up to read.